The Schoharie County Board of Elections has released their official results for last month's hotly contested election cycle, which shows a solid victory for incumbent Sheriff Tony Desmond over his two fellow law enforcement officers - Cobleskill Police Chief Larry Travis and Deputy Sheriff Todd Ethington - with 49.87% of the vote in the 2013 race for Sheriff. Even more impressive was Sheriff Desmond's town-by-town dominance across the county. From his hometown of Sharon Springs to Conesville the incumbent Sheriff carried twelve towns overall, while both his opponents won just two each: Chief Travis in Blenheim and Cobleskill; Deputy Ethington in Jefferson and Summit. 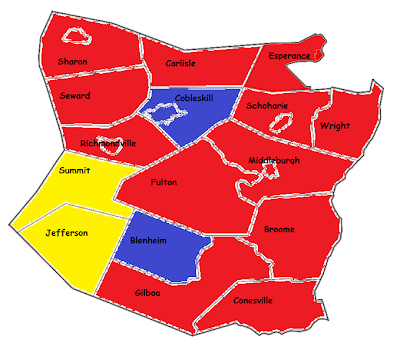 Interestingly enough, this marks the second consecutive election where Sheriff Desmond has lost Cobleskill but still managed to build a large enough base of support across the rest of the county to offset the population center's more than fifteen hundred votes, which went by a healthy margin to their hometown candidate this time around. But now that all is said and done, officially, all three men can return to their positions as law enforcement professionals with last November's race in the past and the protection of Schoharie's citizenry, regardless of who they supported, as their top priority in the present and into the future.